Before :- R.M. Lodha and A.K. Patnaik, JJ. IMPORTANT Dowry death - Allegation of harassment and torture by making demand of dowry - No evidence as to what was the exact act or conduct of accused by which the deceased felt tortured - Conviction set aside. IMPORTANT Demand of dowry by itself is not an offence under Section 498A or Section 304B IPC - What is punishable under Section 498A or Section 304B IPC is the act of cruelty or harassment by the husband or the relative of the husband on the woman. State of Rajasthan Versus Jagdish & Anr. 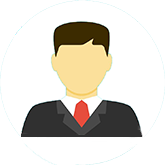 For the Appearing Parties :- Dr. Manish Singhvi, Addl. Adv. General, Ms. Neelam Sharma, Uma Dutta, Kishan Datta, Devanshu Kr. Devesh, Milind Kumar, Advocates. 1. A prosecution witness who merely uses the word "harassed" or "tortured" and does not describe the exact conduct of the accused which, according to him, amounted to harassment or torture may not be believed by the Court in cases under Section 498A and 304B IPC. 2. Husband sentenced to life imprisonment, but sentence reduced to 10 years RI. Demand of dowry by itself is not an offence under Section 498A or Section 304B IPC - What is punishable under Section 498A or Section 304B IPC is the act or cruelty or harassment by the husband or the relative of the husband on the woman. Where there is no evidence as to the actual part played by the accused, a minimum sentence of seven years would serve the ends of justice. 1991(2) RCR (Crl.) 55 relied. D. Indian Penal Code, Section 304B - Indian Penal Code, Section 498A - Dowry death - Evidence that deceased was tortured by accused by making demand of dowry - No evidence what was the exact act and conduct of accused which caused harassment to deceased - Accused may not be convicted where there is no evidence of exact conduct which amounted to harassment - Conviction set aside. E. Indian Penal Code, Section 304B - Soon before Death - Deceased told her mother and brother that accused (husband) made a demand of scooter or Rs. 25,000/- and used to taunt the deceased that she had come from a hungry home - Death of deceased by burning a month after she last visited her mother - Held, it proved that soon before her death the deceased has been subjected by the appellant to taunt in connection with demand for dowry. Even if the deceased was nowhere near expectation of death, still her statement would become admissible under Section 32 of Evidence Act. (1984) 4 SCC 116, AIR 1939 PC 47 relied. Biswajit Halder alias Babu Halder v. State of West Bengal, 2007(2) R.C.R. (Criminal) 395 : 2007(2) R.A.J. 49 : (2008) 1 SCC 202. Durga Prasad v. State of M.P., 2010(3) R.C.R. (Criminal) 219 : 2010(6) SCALE 18. Rattan Singh v. State of H.P., 1997(1) R.C.R. (Criminal) 550 : (1997) 4 SCC 161. Latu Mahto v. State of Bihar (Now Jharkhand), 2008(3) R.C.R. (Criminal) 467 : 2008(4) R.A.J. 199 : (2008) 8 SCC 395. Pawan Kumar v. State of Haryana, 1998(1) R.C.R. (Criminal) 758 : (1998) 3 SCC 309. Sharad Birdhichand Sarda v. State of Maharashtra, (1984) 4 SCC 116. Pakala Narayana Swami v. Emperor, AIR 1939 PC 47. Smt. Shanti v. State of Haryana, 1991(2) R.C.R. (Criminal) 55 : (1991) 1 SCC 371. Kans Raj v. State of Punjab, 2000(2) R.C.R. (Criminal) 695 : (2000) 5 SCC 207. 1. 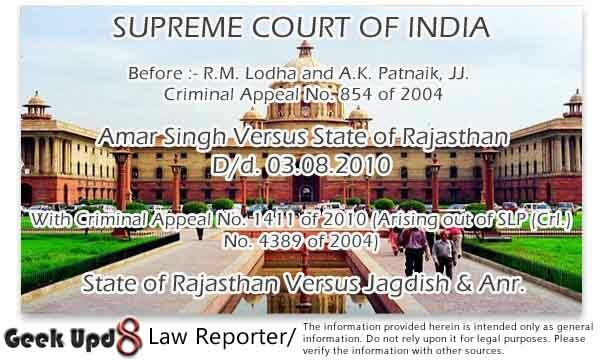 This is an appeal against the judgment dated 07.10.2003 of the High Court of Rajasthan, Jaipur Bench, in D.B. Criminal Appeal No. 816 of 1998. 2. The facts very briefly are that on 05.05.1992 Santosh (the deceased) was married to the appellant and on 08.03.1993 she was found dead in her in-laws house. On the same day, a written report was lodged with the police at the Shivaji Park Police Station at Alwar, by the uncle of the appellant, Ganga Sahai Saini, saying that while the deceased was boiling the water she got engulfed in flames and died. On the same day, another written report was lodged with the police by the father of the deceased, Babu Lal, that the deceased used to be harassed and humiliated in connection with demand of dowry and on receiving the information that she has died in an electric current accident, he rushed to the spot and found the body of Santosh in charred condition. On the basis of such information given by Babu Lal, the police registered FIR No. 53 of 1993 for the offences under Sections 498A and 304B of the Indian Penal Code (for short 'IPC'). The investigation was carried out and charge-sheet was filed by the police in the Court of Additional Chief Judicial Magistrate No. 2, Alwar, against the appellant, Jagdish (younger brother of the appellant), Smt. Gordhani (mother of the appellant), Khem Chand (sister's husband of the appellant), Gyatri Devi (wife of Khem Chand) and Girdhari Lal (father of Khem Chand). The case was committed to the Sessions Court and tried by the Additional Sessions Judge No. 2, Alwar, as Sessions Case No. 32 of 1998. The Additional Sessions Judge framed charges under Section 147, 304B and 498A IPC against all the accused persons. At the trial, the prosecution examined 16 witnesses and exhibited 31 documents. After statement of the accused under Section 313 of the Code of Criminal Procedure (for short 'Cr.P.C. '), no defence witness was examined. The Additional Sessions Judge convicted the appellant, Jagdish and Gordhani under Sections 498A and 304B IPC and imposed the sentence of three years rigorous imprisonment and a fine of Rs. 1,000/-, in default to suffer further three months' simple imprisonment for the offence under Section 498A IPC and imposed the sentence of imprisonment for life and a fine of Rs. 5,000/-, in default further six months' simple imprisonment for the offence under Section 304B IPC. On appeal, the High Court acquitted Jagdish and Gordhani but confirmed the conviction of the appellant under Section 498A and 304B IPC. 3. Mr. Tara Chandra Sharma, learned counsel for the appellant, submitted that the appellant has already served out the sentence under Section 498A IPC and, therefore, his challenge in this appeal is confined to the conviction and sentence under Section 304B IPC. He submitted that the main ingredient of the offence under Section 304B IPC is that the deceased must have been subjected to cruelty or harassment in connection with any "demand for dowry" and in this case the prosecution has not established that the deceased was subjected to cruelty or harassment by the appellant in connection with any demand for dowry. In support of his submission, he relied on the decisions of this Court in Biswajit Halder alias Babu Halder and Others v. State of West Bengal, 2007(2) R.C.R. (Criminal) 395 : 2007(2) R.A.J. 49 : (2008) 1 SCC 202, and Durga Prasad and Another v. The State of M.P., 2010(3) R.C.R. (Criminal) 219 : 2010(6) SCALE 18. He referred to the evidence of PW-2 (father of the deceased), PW-4 (mother of the deceased) and PW-5 (brother of the deceased) to show that there was no demand for dowry made by the appellant and that the appellant only wanted Rs. 10,000/- to start a shop and this request for a sum of Rs. 10,000/- cannot be held to be a demand for dowry. 4. He further submitted that there were, in fact, material contradictions in the testimony of PW-2, PW-4 and PW-5 with regard to the demand for dowry and, therefore, their evidence cannot be relied upon to sustain the conviction of the appellant. He submitted that in any case the evidence of PW-2, PW-4 and PW-5 on whatever was stated to them by the deceased regarding demand for dowry and harassment or cruelty were at best hearsay evidence and not admissible either under Section 60 of the Indian Evidence Act, 1872 or under Section 32 of the Indian Evidence Act, 1872. In support of his submission, he cited Rattan Singh v. State of H.P., 1997(1) R.C.R. (Criminal) 550 : (1997) 4 SCC 161. 5. He finally submitted that the court while recording the statement of the appellant under Section 313 Cr.P.C. did not put any question to enable the appellant to explain any circumstances appearing in the evidence against him. He relied on Latu Mahto and Another v. State of Bihar (Now Jharkhand), 2008(3) R.C.R. (Criminal) 467 : 2008(4) R.A.J. 199 : (2008) 8 SCC 395, to contend that circumstances about which the accused was not asked to explain cannot be used against him. According to learned counsel Mr. Sharma, this is not a case where the prosecution has been able to establish the offence under Section 304B IPC against the appellant and hence the judgment of the High Court should be set aside. 6. Dr. Manish Singhvi, learned counsel appearing for the State of Rajasthan, in reply submitted that the facts of this case would show that the deceased did not die under normal circumstances. He referred to the post-mortem report (Ex.P-21) which indicated that the deceased suffered 100% burns. He submitted that Dr. Mahendra Kr. Gupta (PW-9), who performed the autopsy, has opined that the burns on the deceased were after strangulation and throttling inasmuch as there were fractures of larynx and trachea and the larynx was found congested. He submitted that the deceased got married on 05.05.1992 and died on 08.03.1993 within ten months of the marriage and there was sufficient evidence to show that she was subjected to cruelty and harassment by the appellant and other members of his family. 7. He submitted that the evidence of PW-2, PW-4 and PW-5 establishes that there was demand for dowry of a Scooter or Rs. 25,000-/. He referred to the evidence of PW-4 and PW-5 to show that the appellant used to taunt the deceased saying that she has come from a hungry house and that the appellant had himself visited the house of PW-4 and demanded a sum of Rs. 10,000/-. He vehemently submitted that this is a clear case of continuous harassment of the deceased in connection with demand of dowry not only by the appellant but also by his other family members. He cited Pawan Kumar and Others v. State of Haryana, 1998(1) R.C.R. (Criminal) 758 : (1998) 3 SCC 309, to contend that such taunting and teasing of a bride for not bringing dowry amount to harassment or cruelty within the meaning of Section 304B IPC. 8. In reply to the submission of Mr. Sharma that statements made by the deceased before PW-2, PW-4 and PW-5 regarding harassment and demand of dowry were not admissible either under Section 60 or under Section 32 of the Evidence Act, he submitted that this Court in Sharad Birdhichand Sarda v. State of Maharashtra, (1984) 4 SCC 116, has held that Section 32 of the Indian Evidence Act is an exception to the rule of hearsay and makes admissible the statement of a person who dies, provided the statement related to the cause of death or exhibits circumstances leading to the death. He submitted that in the present case the statements made by the deceased to PW- 2, PW-4 and PW-5 related to the cause of her death, namely, demand for dowry and therefore would be admissible under Section 32 of the Indian Evidence Act, even if the deceased while making the statement was not expecting the death. He submitted that in the present case the prosecution has firmly established that soon before her death the deceased has been subjected to cruelty or harassment by the appellant in connection with demand for dowry and therefore the Court has to presume under Section 113B of the Indian Evidence Act that the appellant has caused the dowry death and this presumption has not been rebutted by the appellant by leading any evidence. 10. We find that the evidence of PW-4 (mother of the deceased) is that after marriage, the deceased came several times and she also came about one month prior to her death and she used to complain about the demand of a Scooter and harassment by her mother-in-law Gordhani and that she had also told that the appellant used to taunt her that she has come from a hungry house and brought nothing and the last time when she came she stayed for two days and returned and one month thereafter she was murdered. Similar is the evidence of PW-5 (brother of the deceased) that whenever the deceased used to come home she used to complain that her in-laws have been teasing her and she had also stated that they demanded Scooter or Rs. 25,000/- for a shop and that one month prior to her death she came home and complained that her mother-in-law and all other in-laws used to torture her and taunt her that she did not bring anything and that the appellant also used to tease her. It is thus clear from the evidence of PW-4, as corroborated by the evidence of PW-5, that the deceased has made statements before them that her in-laws as well as the appellant have been demanding a Scooter or Rs. 25,000/- for a shop and have been taunting and teasing her for not meeting the demand of dowry within a couple of months before her death. Such evidence of PW-4 and PW-5 with regard to the statements made by the deceased is no doubt hearsay but is admissible under clause (1) of Section 32 of the Indian Evidence Act. 11. Clause (1) of Section 32 of the Indian Evidence Act provides that statements made by a person as to the cause of his death, or as to any of the circumstances of the transaction which resulted in his death, in cases in which the cause of that person's death comes into question, are themselves relevant facts. In the present case, the cause of death of the deceased was a question to be decided and the statements made by the deceased before PW-4 and PW-5 that the appellant used to taunt the deceased in connection with demand of a Scooter or Rs. 25,000/- within a couple of months before the death of the deceased are statements as to "the circumstances of the transaction which resulted in her death" within the meaning of Section 32(1) of the Indian Evidence Act. 12. In Pakala Narayana Swami v. Emperor, [AIR 1939 PC 47] Lord Atkin held that circumstances of the transaction which resulted in the death of the declarant will be admissible if such circumstances have some proximate relation to the actual occurrence. The test laid down by Lord Atkin has been quoted in the judgment of Fazal Ali, J. in Sharad Birdhichand Sarda v. State of Maharashtra (supra) and His Lordship has held that Section 32 of the Indian Evidence Act is an exception to the rule of hearsay evidence and in view of the peculiar conditions in the Indian Society has widen the sphere to avoid injustice. His Lordship has held that where the main evidence consists of statements and letters written by the deceased which are directly connected with or related to her death and which reveal a tell-tale story, the said statements would clearly fall within the four corners of Section 32 and, therefore, admissible and the distance of time alone in such cases would not make the statements irrelevant. The difference in the English Law and the Indian Law has been reiterated in Rattan Singh v. State of H.P. (supra) and it has been held therein that even if the deceased was nowhere near expectation of death, still her statement would become admissible under Section 32(1) of the Indian Evidence Act, though not as a dying declaration as such, provided it satisfies one of the two conditions set forth in this sub- section. The argument of Mr. Sharma, therefore, that the evidence of PW-4 and PW-5 regarding the statements made by the deceased before them are hearsay and are not admissible is misconceived. 17. The fact remains that the appellant was not charged for the offence of murder under Section 302 IPC presumably because during investigation no materials were available to establish the offence under Section 302 IPC against the appellant. In Smt. Shanti and Another v. State of Haryana, 1991(2) R.C.R. (Criminal) 55 : (1991) 1 SCC 371, cited by Mr. Sharma, this Court has held that where there is no evidence as to the actual part played by the accused, a minimum sentence of seven years would serve the ends of justice. In the present case, since there is no evidence as to the actual role played by the appellant in the death of the deceased, a punishment of ten years' imprisonment would suffice in the ends of justice. 20. This is an appeal filed by the State of Rajasthan against the judgment dated 07.10.2003 of the High Court of Rajasthan, Jaipur Bench, in D.B. Criminal Appeal No. 816 of 1998 acquitting Jagdish and Gordhani of the charges under Sections 498A and 304B IPC. 21. The only contention raised by Dr. Manish Singhvi, learned counsel for the State of Rajasthan, is that although the evidence on record against Amar Singh, Jagdish and Gordhani was the same, the High Court took the view that Jagdish and Gordhani have been implicated because they were members of Amar Singh's family and that the charges against them are not proved beyond reasonable doubt. He vehemently submitted that no reasons whatsoever have been indicated by the High Court in the impugned judgment to show how the cases of Jagdish and Gordhani were different from that of Amar Singh. According to him, the High Court should have sustained the order of the trial court convicting Jagdish and Gordhani. 22. We are unable to accept this submission of Dr. Singhvi. The evidence of PW-2, PW-4 and PW-5 shows that Jagdish and Gordhani played a role in the demand of dowry of a Scooter or Rs. 25,000/- for Amar Singh, but demand of dowry by itself is not an offence under Section 498A or Section 304B IPC. What is punishable under Section 498A or Section 304B IPC is the act of cruelty or harassment by the husband or the relative of the husband on the woman. It will be also clear from Section 113B of the Indian Evidence Act that only when it is shown that soon before her death a woman has been subjected by any person to cruelty or harassment for, or in connection with, any demand for dowry, the Court shall presume that such person had caused the dowry death within the meaning of Section 304B IPC. The act of subjecting a woman to cruelty or harassment for, or in connection with, any demand for dowry by the accused, therefore, must be established by the prosecution for the Court to presume that the accused has caused the dowry death. 23. PW-2 (father of the deceased) has not stated in his evidence before the Court that Jagdish and Gordhani, in any way, subjected the deceased to any harassment or cruelty. PW-4 (mother of the deceased), however, has stated that the deceased used to complain about the demand of a Scooter by Girdhari and harassment by her mother-in-law Gordhani, but PW-4 has not stated what was the exact act of Gordhani by which the deceased felt harassed. The evidence of PW-5 (brother of the deceased) is that whenever the deceased used to come home she used to complain that her in-laws have been teasing her and they were demanding a Scooter or Rs. 25,000/- for a shop and that when the deceased came home one month prior to her death, she complained that her mother-in-law and all other in-laws used to torture her and taunt her that she did not bring anything, but PW-5 has not described the exact conduct of the mother-in-law and other in-laws on account of which the deceased felt tortured and taunted. On the other hand, the evidence of PW-4 is clear that Amar Singh used to taunt her that she has come from a hungry house. Thus, there was evidence in the case of Amar Singh about his exact conduct which caused harassment to the deceased but there was no such evidence in the case of Jagdish and Gordhani. A prosecution witness who merely uses the word "harassed" or "tortured" and does not describe the exact conduct of the accused which, according to him, amounted to harassment or torture may not be believed by the Court in cases under Section 498A and 304B IPC. For this reason, the High Court has taken a view that the charges against Jagdish and Gordhani have not been established beyond reasonable doubt and that their case is distinguishable from that of Amar Singh and that Jagdish and Gordhani appear to have been implicated because they were members of Amar Singh's family. 24. In Kans Raj v. State of Punjab and Others, 2000(2) R.C.R. (Criminal) 695 : (2000) 5 SCC 207, this Court cautioned that in cases where accusations of dowry deaths are made, the overt acts attributed to persons other than the husband are required to be proved beyond reasonable doubt and by mere conjectures and implications such relations cannot be held guilty for the offence relating to dowry deaths. In the aforesaid case, this Court further observed that a tendency has developed for roping in all relations of the in- laws of the deceased wives in the matters of dowry deaths which, if not discouraged, is likely to affect the case of the prosecution even against the real culprits. 25. We, therefore, do not find any substance in the contention of Dr. Singhvi that the High Court should have sustained the conviction of Jagdish and Gordhani and we accordingly dismiss this appeal. Sir, I have also copied the same here. thanks alot, and in reply to what you said, i would say, that the time wont come back ofcourse. but these type of judgments make people believe in law, and give a hope, as all this is not easily available to lay man, this website was started. hope literate people like you, would further help us in achieving the same.